The Young Turner: Ambitions in Architecture and the Art of Perspective at Worcester City Art Gallery & Museum, presents some of JMW Turner’s first commissions and contemporaneously celebrated work. The exhibition runs from 4 May until 6 July 2019. This touring exhibition from the Ashmolean Museum, University of Oxford focuses on Turner’s drawings, paintings and engravings of Oxford and the Midlands, from the 1780s to the 1810s. They exemplify his interest in Gothic architecture, his increasing expertise in depicting it and his growing knowledge of perspective. The styles and subject matters are also indicative of some of the people and artworks that initially inspired him. On show will be Turner’s first sketchbook and some of his diagrams for the lectures in perspective he gave at the Royal Academy, which have rarely been exhibited. 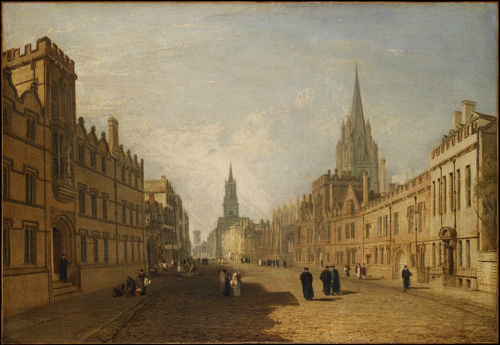 Turner’s oil painting A View of the High Street, Oxford, 1809-10, is the centrepiece of the exhibition. It is a major new acquisition at the Ashmolean Museum and a unique pinnacle of the artist’s early output. The museum acquired this work with generous support from the Heritage Lottery Fund, the Art Fund, the Ashmolean’s Friends and Patrons, and members of the public. This tour, which celebrates and provides context to the acquisition for a wide audience, has also been made possible by the Heritage Lottery Fund. The works on display are drawn primarily from collections in the Ashmolean Museum, and are complemented by loans from the Tate and several private collections.